Could there possibly be too many curries in the world? I say, no. I’ve been super into red curries lately for their spicy, smoky kick. And because chickpeas lend so beautifully to spicy sauces, they are my protein of choice here. This recipe is simple, requiring just 1 pot and 30 minutes to prepare! Plus, the ingredients are simple and versatile. Don’t have eggplant? Omit or sub for mushrooms or zucchini. Don’t have bamboo shoots? Leave ’em out. Looking for more protein? Be sure to include the green peas, which provide 8 grams per cup! This would make the perfect weeknight meal when you’re craving something hearty but are short on time. It would also be great for entertaining guests as it’s sure to please vegans and non-vegans alike. Serve as is or over white or brown rice, quinoa, or my recent love – cauliflower rice. If you give this recipe a try, let us know! We love seeing your comments, ratings, and photos tagged #minimalistbaker on Instagram. Cheers, friends! 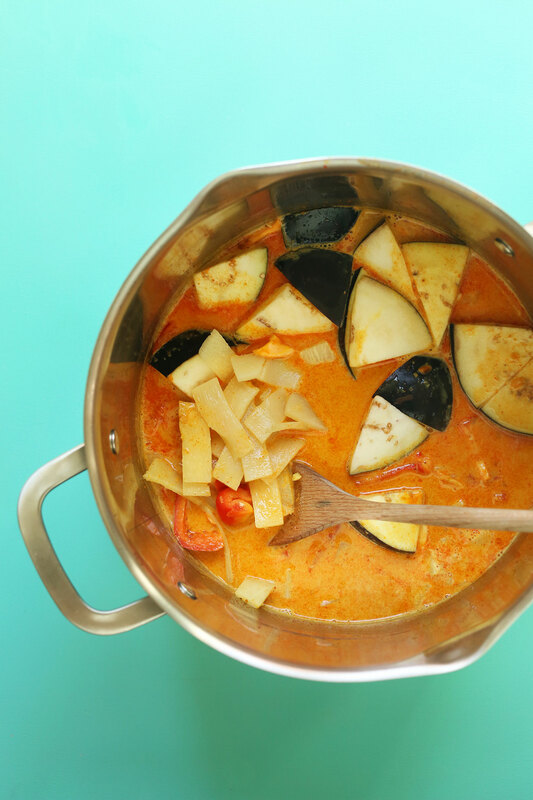 A flavorful 1-pot red curry with coconut milk, bell pepper, eggplant, bamboo shoots, and chickpeas! Full of plant-based protein and fiber. *My favorite vegan-friendly curry brands are Thai Kitchen and Thai True. *Nutrition information is a rough estimate calculated without rice, toppings, or peas. Excellent flavor, easy and quick! I was surprised at howc the eggplant worked. Very adaptable, too — added spinach and cubed butternut squash the 2nd time and served over quinoa with plain yogurt. Yum! This was delicious! I used zucchini instead of eggplant and served it with cauliflower rice. I didn’t add any sugar because I don’t have a sweet tooth. I added some tamari because I have an umami tooth! It was filling and rich, yet light at the same time. I will definitely be making this again. I made it tonight for my family and it was a hit. I didn’t use the bamboo shoots or peas, but added spinach at the end. I sweated the eggplant and it was perfect. Such a cozy meal, perfect for a chilly night. Thank you! We are so glad this recipe was a hit. Thanks for sharing, Kathryn! 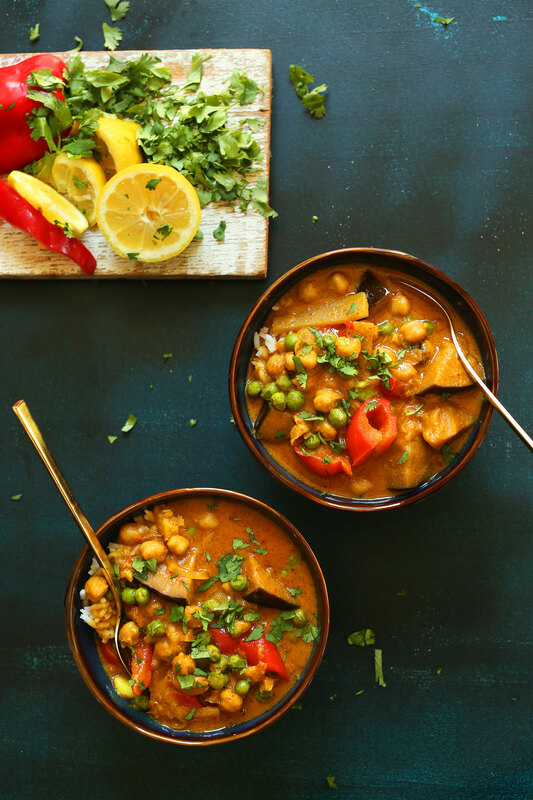 I made this but changed quite a lot as I love curries … It turned out wonderfully though. I replaced the onion with 150g celery. I only used 200ml coconut milk, but I added 500 ml vegetable stock. I left out the sugar, the oil, the bamboo and the tumeric; I added 1 tablespoon of cumin seeds – spluttered in and added 1 tablespoon coriander powder. Yeah, so same same but different. Turned out to be SUPER DELISH and a new fave. I am going to add roasted pumpkin next time for a kick, I feel it would have gone well with the flavours. I made this with the left over eggplant from the Moroccan lentil stuffed eggplant and the two dishes contrast really nicely. Thanks for sharing your changes, Alli! I had a garden full of eggplant, love curry, and can usually pull off nearly any recipe by Minimalist Baker. This was yet another super easy and delicious no-brainer. Fantastic, yum, and thanks! I just used what I had, which was half a red onion, two cups of cups eggplant and no bamboo, and a can of regular coconut milk plus one can water, and white sugar. This was really good! I added 1 and 1/3 cup of peas as well as 3 cups of spinach for 2 servings and also threw in some cumin and garam masala. It was a bit too sweet even after I reduced the sugar by 2/3s, but still totally yummy! Yum! Thanks for sharing your recipe changes, Sacia! Great recipe! I did add 1 chopped carrot. Next time I’ll omit the eggplant (I only like eggplant fried and pureed apparently LOL) and half the amount of coconut milk so the dish is thicker! Gratitude ? I was not even feeling like eating curry but somehow got pulled into the recipe and now its a lovely pot of bubbling spicy coconut-ty goodness. Did make a very unique adjustment – because I had coconut oil but no coconut milk (we don’t really use it) – I added what I could of the oil. Then, to get the creaminess, I blended oats into a powder, made into a paste with water and stirred it in. It adds some rich thickness that would have came from the milk, without the extra fat. That said, there’s plenty of good fats in the dish I’ve made, to go round. Thanks for the idea for dinner! This is so good. I love it and will make it again. I subbed potatoes for the eggplant, since I didn’t have any. Otherwise, I followed your recipe to the T! You are awesome. Absolutely delicious, quick and easy to follow recipe! I also added some frozen leaf spinach and it added lovely colour, and of course extra nutrients. This was great! I only used one can of coconut milk and I’m not vegan so I added fish sauce for flavor. I also added two tomatoes and only 1 tbsp of sugar. It wasn’t spicy at all so I added red chili flakes as well. I’m eating it with quinoa and my bf will eat it with a side of spinach because he’s doing low carb. Thanks so much for this great recipe! what a great recipe. so tasty and creamy and delicious. I used just 3 tablespoons of coconut sugar and found it perfect. Thanks so much for sharing. Did anybody have problems with the eggplant? I always sweat my eggplant with salt on both sides to extract the bitterness, however the recipe doesn’t say to do this. The eggplant in my curry was a bit tough. I am wondering if sweating them is not necessary. I made this last night and I was really excited because I’ve made recipes from your site before and they usually are pretty spot-on. I will say that I thought the bamboo-shoots overpowered the recipe. Maybe it was the brand I bought (I did rinse/drain them), but it put off a bad smell and taste that I assumed would cook out in the recipe (but unfortunately it didn’t). I think also it’s important to only stick to veggies you like because this made a lot of food and cost a decent amount for ingredients and I won’t be eating the rest. So basically my advice to those wanting to make this is to stick to vegetables you really like and skip ones your not sure of since this recipe makes a lot. I still love your site just wanted to help out the next person. Just made this for dinner and the flavour balance is on point! Love it! Spicy, sweet creamy … and loaded with veggies! It’s heaven! Thanks for another fabulous recipe Minimalist Baker! Just FYI, when you use mushrooms INSTEAD of eggplant, you do not sub the eggplant “for” mushrooms. That’s backward. You either sub the eggplant WITH mushrooms or you sub the mushrooms FOR the eggplant. If you’re using the expression “substitute FOR,” the ingredients should be in the same order as if you said “instead of.” So in this recipe — no eggplants? Using mushrooms INSTEAD of eggplant? Sub mushrooms FOR eggplant. I don’t know why so many people get this wrong. It’s common sense. Thanks so much for this delicious and easy recipe! For my first time making curry, this one was a home run and I can’t wait to make it again! I used thinly sliced seitan in the recipe as well and highly recommend it. Do you have any recipes for panang curry? This recipe was an amazing inspiration! I detest ginger so I started off sautéing onion and garlic and then added Penzey’s The Now Curry powder and then vegan red curry paste. Added coconut milk and maple sugar because I don’t have coconut sugar. Then I added chickpeas, green peas, a diced potato and some raw cashews. Also baked some tofu with coconut oil and the same curry powder until it was crispy. Served over quinoa and mixed it all together. It was amazing and there’s enough for leftovers! Oh this is a winner! Loved the added turmeric. This has such a great base start , I played around a bit and possibilities are endless . I used 3 T chili paste ( as stated), and one jalepeno, no bamboo shoots , but used twice as much eggplant , added handful of mushrooms, about -one cup of winter squash ( leftover), and the next night a small cooked and cut up sweet potato to the left overs. My daughter wanted recipe and we just couldn’t stop commenting about this one. Thank you , Thank you!! I liked a lot of things about this recipe. The bamboo shoots, chickpeas and peas all tasted amazing together. But I found it to be missing that umami that Thai curries are known for. Of course, most of the time that’s from a fish-based paste (fish sauce or shrimp paste) but I added some soy sauce after I was finished cooking because it needed that oomph. I’d recommend adding soy sauce to the recipe. In addition, I ended up adding about an extra 1 tbsp of curry paste. I also felt that the amount of sugar and coconut milk were too sweet. Next time I would probably decrease the amount of coconut milk and replace it with salty vegetable broth, and start with a few tsps of sugar at a time. I love Thai curries with coconut milk. I usually don’t eat them at home but I think I can attempt this recipe! I’m going to try. I like the fact it only takes 30 minutes. It looks absolutely delicious. Love this recipe, make it all the time when I have last minute guests for dinner and want something easy and flavorful. Hard to find bamboo where I live so I’ve been using chestnuts instead and love them in this dish. Thanks for another great recipe Dana! I normally make a quick Thai curry with paste, veggies and coconut milk. That’s it. It tastes fine, but not spectacular. So a few days ago, I decided to try this recipe. It requires a bit more love and attention than my usual method, which is a challenge with my demanding toddler. But it was so worth it – the extra garlic and ginger really lifted the flavour, so it tasted like the nice curries you get at restaurants, not the ‘meh’ curry I normally dish up. This recipe will become a staple in my household. Just made this, added peas, cauliflower and firm tofu,one of the best curries I have ever made! I have gone to 3 classes on how to cook curry and they didn’t compare to this!!! Dana, it´s delicious. I just made it for dinner tonight and my husband loved it!! 5 Stars. Related to the comment above about the coconut sugar, we didn´t have any here in Barcelona either, so I just added a carrot to the sauté to sweeten the pot. Thanks again. Love your recipes! Hi Lynn! I think other sugars would work fine, but you might want to use a little less as coconut sugar is not as sweet as cane sugar! We haven’t tried it but I think it could work! This looks wonderful! I was wondering if I could sub maple syrup for the coconut sugar. Can’t wait to try this!! Hi Sonia! I’m not so sure that would work but if you give it a try, let us know hot it turns out! Is it suppose to be like a soup because it’s not thick at all?? It’s mostly a soupy texture! I used half the coconut milk. It becomes thicker and reduces fat content. I’ve made it 3 times, it’s great: veggie increase and it tastes good! What is the best healthy/ tasting alternative for coconut as sadly I’m allergic to coconut and nuts. Would soya milk and a standard sweetner work? I made this tonight and it was delicious! I had more than 3 tbsp left of curry paste in my jar so I added it all in. I also forgot bamboo shoots. But overall this was excellent. My husband and I can handle more spice than most so I added a whole Serrano pepper and sriracha afterwards. I think next time I might add mushrooms (or sub mushrooms for eggplant) because I think they would taste delicious in this. I love all of your recipes. I made your vegan beer chili while camping this past weekend and it was a hit! Thank you so much for all that you do! I’m so glad I found this recipe. I’m feeling like something healthy but still delicious on this cold wet Wednesday. Can’t wait to try it tonight! I just made this curry tonight and it turned out really well! Opted for zucchini instead of eggplant, which was just as easy, quick and delicious. It was sort of spicy (due to the kind of curry paste I used) but still well balanced with coconut milk and sugar. As a side we decided for home made naan bread wich was the perfect addition to the dish. Happy to make it again! Really tasty but really spicy! (and I did decrease the amount of the curry by 1 tbsp). I used mushrooms instead of eggplant and loved the dish a lot. Instead of serving it with rice, I made idli: delish! Leftovers are even better! Just tried the coconut red curry with chick peas. I couldn’t find the recommended brand of curry paste so I bought and used Maesri. I was just wondering if there might be a mistake with the recipe having 3 tbsp of curry paste? While I thought it was delicious, my mom thought it was way too spicy. Is the recipe with your Thai Kitchen or Thai True spicy hot? I can’t specifically remember which one I used for that recipe, I tend to bounce between the two and don’t prefer one over the other! We like things SPICY in our house but obviously that’s a personal preference so feel free to cut back on the curry paste if it was too much for you! Hi Dana! I was out of eggplant and peppers so I roasted a diced sweet potato with olive oil and a little salt free seasoning. I did what was suggested and tasted and added red pepper and more curry paste since I tend to like things really spicy. It was SO delicious!!!!! I tagged a pic on my Instagram @jessgoines8609. It really was one pot and super fast and easy to make! Highly recommend to anyone who loves curry! Was very excited to try this recipe. It was quick and easy, but we found it very bland even after adding an extra Tbsp red curry paste and we did mince and used a Serrano pepper. Go to India. Very good and somewhat unique. I will modify to my picky taste but definitely a keeper. Merci beaucoup!! Second Dana recipe I try. I appreciate both! Hi, Kim. I have the same issue, and usually substitute plant milk (eg soy, almond) mixed with a little coconut extract, if that helps . . .
Hi Dana , If you really want to make an authentic mixed vegetable Indian Curry that is a medley of vegetables and lentils , while combining all your flavors through wholesome ingredients , please try making a Sambhar. You’ll have to find a few ingredients at your local Indian store , but it is so worth it. TO start with I think instead of trying to make the spice mix yourself , there is a great brand that makes it beautifully. MTR Masala, you ll have to get tamarind paste and jaggery or you could sub with any other sweetner. The instructions on the pack are really simple and you will absolutely love the end result. If i could put links down here , i would. But honestly just try to source the MTR Sambhar Masala and the recipe is super easy to execute. Cheers ! That was sooo delicious. Thank you for the recepe! Ohh lovely.. U can also try college Grill , Stoke On Trent.. I think they offer the best takeaway food in Stoke. The most important part is u can order online also. This looks amazing! I am always looking for good vegetarian recipes! That looks like a perfect fall soup! 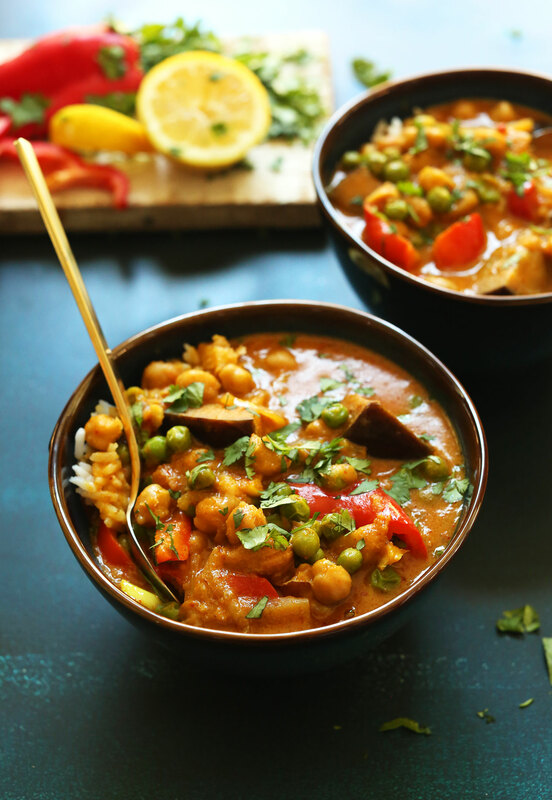 This curry is simple, quick and easy to make but the flavors are so exotic and super delicious! LOVE!!!! This looks good. Can’t wait to try this recipe. May I ask what brand Red curry you use. Thank you for info. Hey Dana! Instead of using (and buying!) 2 cans of light coconut milk, I suggest buying 1 can of full fat coconut milk, and then using 1/2 coconut milk – 1/2 water mix! Great idea! Although sometimes I find the flavor of full fat or coconut cream to be more pungent than light so I still prefer it! The recipe came to my inbox this afternoon so we had it for supper tonight. We don’t care for eggplant so I used zucchini. And I had no bamboo shoots so I used fresh mushrooms and cooked them with the peppers. I added the peas, fresh basil and a little cayenne pepper. It was absolutely delicious and we are looking forward to left overs tomorrow! The small amount of sugar made the spices stand out. It is a fast, tasty recipe I will use again for weeknight suppers. Hi, Annette! This comment is not to disparage Dana or anyone else, but to support you in your concern. I rarely, if ever, use of any type of sugar or any other processed and/or artificial sweeteners because of health reasons. A Nutrarian option (as per Dr. Joel Fuhrman) that works well for me and my husband is to use plain applesauce, or to add diced apple or pear to recipes. In curry dishes, I frequently use dried, chopped fruit such as apricots, raisins, and cranberries, which I either rehydrate in water in advance or soften the fruit while cooking, adding a tiny bit more liquid to the dish. I hope this tip is helpful! favorite with so many delicious recipes.You rule! 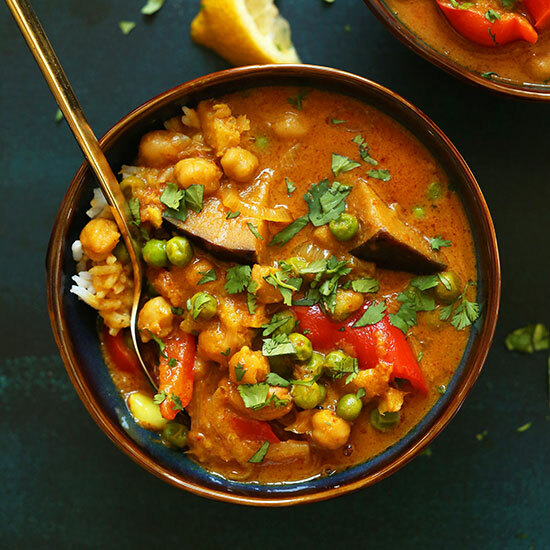 I cant wait to make this one as I too have discovered a love of red curry,its very addicting.Then to add fresh basil on top,oh my.Thanks greatly for sharing ? Just wondering if all of your Minimalist Baker recipes are able to be divided if I only wanted like half, quarter etc of the recipe serving? And also, I know that this is such an old recipe but for your simple blackberry cobbler recipe, is there a substitute for the cast iron pan? Maybe a glass baking dish or…? Thank you so much! And this recipe looks amazing! Hi Dana, this looks so good! I noticed you didn’t mention salting the eggplant and letting it sit before cooking. How is the texture of the eggplant without that step? Thanks for sharing!! It’s fine! I didn’t notice a difference. But that’s certainly a step you can add to improve the texture/flavor even more! Hey Dana, thanks for this recipe! I just made it and it took 30 minutes start to finish as you said and it’s lovely. I didn’t have eggplant, so I used one of my favourite curry ingredients – potatoes! Just before adding the peas, I took out about a cup of the potato/chick peas and mashed them up, then added them back in for a thicker consistency. I also used a “bundle” of cilantro…when I buy a bunch, after stripping the leaves, I bundle bunches of the stems and tie them with twine, put them in a bag and pop into the freezer. Then, when I just want to add flavour, I take out a bundle and add it to whatever I’m making. Just make sure you tie them up tightly because once the get warm, they wilt and compress. Take them out of the pot in one bunch whenever they’ve given up their goodness. Thanks again! That’s a great idea about the cilantro bundles! 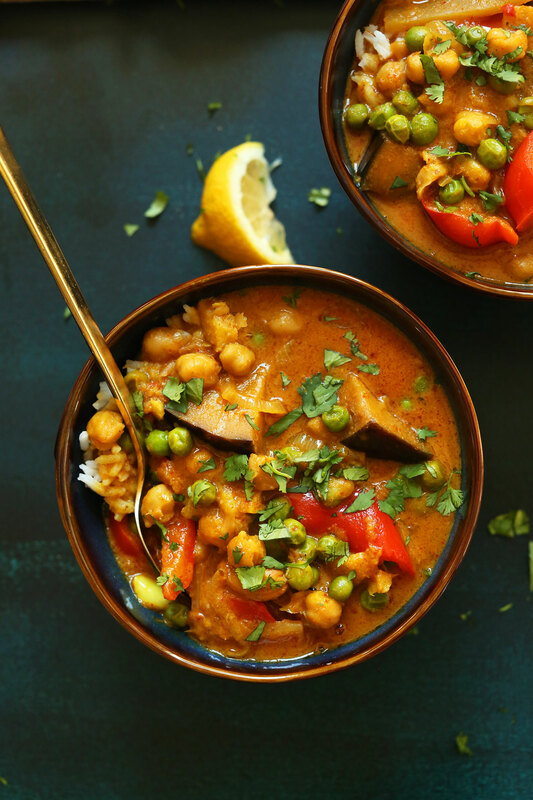 I’ve been hesitant to try to make curries, but this sounds so easy and delicious. Thanks! Yup. Agreed. Love the eggplant and red pepper in here too! But can’t say I’ve tried curry too often. However, my husband is not the biggest eggplant fan so it takes some convincing to get him to go for it. Was just reading in the paper that 15-18 vegans can eat using the same amount of land it takes one person to eat the standard American diet!!!!! WOW.